Music in the Garden, the Eugene Symphony Guild’s flagship fundraiser, is a self-guided tour of Five private gardens in the Eugene area. In 2019, we will celebrate 22 years of Music in the Garden tours. Music in the Garden is held the second Sunday in June from 10 AM to 4 PM. Many of the gardens we select have been developed by homeowners; others have been professionally designed. Music in the Garden is very popular with the Eugene community with more than 800 people visiting the gardens each year. Don’t miss visiting these wonderful private gardens for ideas for your own garden. More than 100 community musicians donate their talent in ensembles large and small to provide live music all day long in every garden. The tour includes refreshments and drawings for prizes. A variety of garden art is offered by vendors. 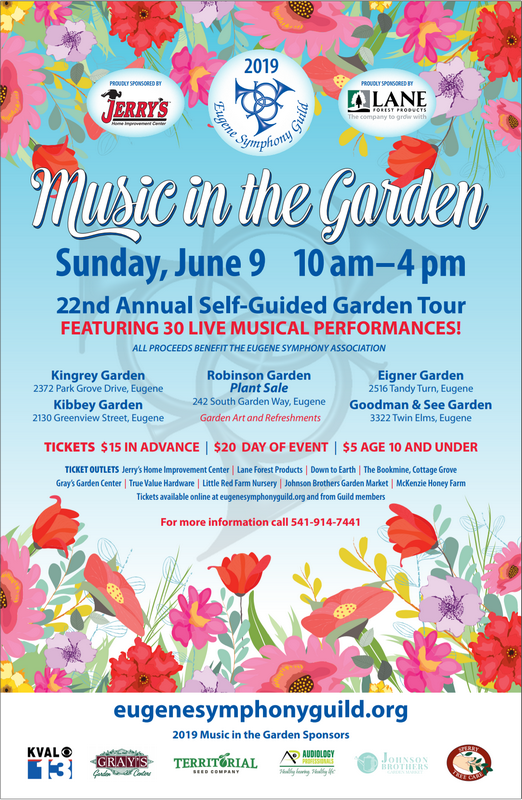 Tickets to Music in the Garden can be purchased in advance at various local nurseries at a discount or on the day of the tour at any of the Five gardens. The Music in the Garden Tour is held rain or shine. Click here for online tickets and registration.